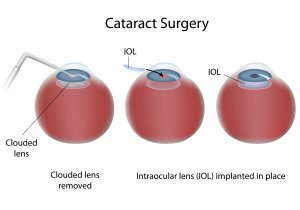 If your vision is blurred due to cataracts and you are pursuing surgical intervention to correct the problem, you are likely considering which intraocular lens (IOL) to choose, to restore your vision after cataract surgery. There are a variety of IOL options to choose from. Your ophthalmologist can help you decide which is appropriate for you and your lifestyle. IOLs used to be made of rigid plastic. Now, softer, foldable silicone and acrylic IOLs allow the eye surgeon to roll up an IOL and insert it through a smaller incision. Once inserted, the IOL opens up to full size. Many IOLs now include built-in protection from damaging ultraviolet rays. The most popular type, monofocal IOLs allow eyes to focus at a single distance. This could be far, near or in between. Your most important activities dictate which distance you should choose. Readers and crafters might opt for clear near vision and wear glasses for distance vision. People who drive a lot or prefer TV to books can get an IOL for distance vision and wear glasses for close-up activities. If you spend a lot of time at the computer, you can choose the intermediate IOL, which focuses best at a distance of 18 to 36 inches. Most people get IOLs equipped for distance vision. If you are getting cataract surgery in both eyes, you could choose monovision. With monovision, your ophthalmologist places an IOL in one eye that allows you see well close up while placing an IOL in the other eye that allows you to see objects in the distance. Over time, your eyes should adjust to monovision, allowing you see well at both distances. However, not everybody adjusts well to monovision, which compromises depth perception. If you’re considering this strategy, discuss it with your ophthalmologist. Your eye doctor can usually let you test out monovision using contact lenses in the office before your procedure. Accommodating IOLs move, or flex, with the eye’s natural muscle movement, often allowing the patient to see well at multiple distances, instead of at a single distance as with monofocal lenses. Many people who get multifocal IOLs no longer need glasses for distance or close vision. This type of IOL is like bifocal eyeglasses, but it allows patients to see well at more than just two distances. Different areas of the IOL have different focusing power. However, some patients experience problems with night vision, glare and halos after getting multifocal IOLs. Let us help you navigate the exciting but sometimes overwhelming world of IOLs. Call us today and we’ll work together to help you achieve your best possible vision.